Finally! As promised in my February 12th entry about Art’s Alternate recordings, it’s now time to examine the differences between Aaron’s recordings and their alternate versions. The alternate version is the same take as the original version except for two significant differences. It is missing a vibraphone* overdub, which features prominently on the original version. Also, the alternate, undubbed version features an extra 12 seconds during which the vocal “choir” (sans Aaron) sings a final “show me the way” at a much slower speed than the rest of the song, followed by a loud piano chord and softer, single bass note. * If you are not familiar with it, a vibraphone (also called a vibraharp) is a xylophone-like percussion instrument, with metal keys. Here is a video, featuring a vibraphone solo so you’ll know what sound to be listening for. Despite the timing difference, the two versions are the same take except that the alternate version is missing vibraphone overdubs, which are found on the original version. It appears as though the timing difference is the result of the alternate version’s running a hair faster. A couple significant differences make these two versions very easy to differentiate. The original version features a melodic piano introduction with a predominant vibraphone part throughout the recording. The alternate version starts with triplet arpeggios on piano and the entire track is vibraphone-free. The two versions are identical through the first 2:17 of the track. At that point, the single version features a prominent piano part with the backing vocalists repeating the song’s title, “humdinger” until the song fades out. On the alternate (unedited master) take, the verse which begins “I bought my baby child a diamond ring. It was a humdinger” is repeated and faded out. This one is the trickiest to differentiate and some discs incorrectly identify which version they contain. Aaron’s phrasing is different between the two versions (and the backing vocals are mixed lower on the alternate take.) The only lyrical differences are: (1) a single word during the first verse and (2) the improvised singing at the end, during the song’s fade-out. During the first verse (“Every time the telephone rings I hold my breath. Hoping that it’s you, I’m scared to death. [The] phone went ring, my crippled heart cried. Let it be you, on the line”) the word “the” preceding the word “phone” exists in the alternate version but NOT in the original, single version. A somewhat more obvious clue can be heard during the song’s fade-out (following the lyrics “Hold on baby, ’til I tell these blues goodbye. ‘Til I tell these blues goodbye.”) On the original, single version, Aaron hums (“mm-mm-mm”) while he SINGS “whoa whoa yeahhh” on the alternate version. To my ears, the two versions sound like variations of the same recording. Besides the significant timing difference, the original version (again) features a flute overdub that is missing from the alternate version. While the flute part on “For Every Boy…” is at least tolerable to my ears, it sticks out like a sore thumb here. The entire song has a swinging feel to it, while the flute is played straight, making it sound all the more like it was an afterthought. The original version is so much longer because it features an instrumental solo (again marred by the flute part) and a repeat of the song’s bridge (“I’ve been in love before. I’ve been hurt before. I thought I was through with being a fool, but I ended up in the same shoes once more.”) The verse, which immediately follows the bridge the first time around (“Once again I sit alone, wondering and worrying all night long over you. I’ve done it again”) is also repeated. This one is tricky. Not so much because the three versions are hard to differentiate, but because various sources describe certain versions differently. Ignore the weak liner notes and trust your ears! According to some sources, a version of this song was released on the “Art and Aaron Neville” LP (Bandy 70013,) a “fact” which I reproduced on the NevilleTracks discography. The song does NOT appear on my copy of that LP, nor on any copy I’ve ever encountered, so I can’t say for sure that it really exists. I have found three versions of this song. Version 1 (probably the closest thing to a “single version” that we have) seems to be nothing more than Version 2, faded out five seconds early. Version 2 has a cold ending, rather than a fade out. It ends with a “campy” piano/drum/sax tag. The sax solo on both sound the same, but I suspect that’s because the sax player played the solo the same way both times. The “tick tock” effect on this version sounds very different. It sounds more like “tock tock” than “tick tock” because the pitch doesn’t vary the way it does on the “single version.” This “tock tock” slows down a hair at the end and comes to a dead stop, rather than being faded out. Lyrically, there are a couple significant differences to help the listener spot which version s/he is listening to. On the original Parlo recording, the piano arpeggio at the very beginning is much slower than that on the remake. The piano provides the rhythm on the Parlo version, with the guitar accenting the off-beats (2 and 4.) On the remake, the guitar is not just providing accents; it is the prominent rhythm instrument. Lyrically, Aaron takes a lot of liberties on the remake. During the second verse, (“If you are serious, then don’t play with my heart, it makes me furious”) Aaron sings the lyrics as “If you are serious little girl, little girl, little girl, then don’t play with my heart, it makes me furious.” There are several of these lyrical improvisations throughout the song. The original 45 version is a half minute shorter than the alternate version. On most unauthorized reissues, it is the alternate version that is included and NOT the original single version. The single version features string overdubs & double-tracked vocals, neither of which is on the alternate version. How many of us have purchased an entire album, just to possess a single track from that album? I’d dare bet that anyone who seriously collects the recordings of any musician or band has done this (and probably more than once.) I can’t even count the number of discs in my collection, which I would never own otherwise, if not for that one track… the one, which features a contribution from some musician I really like. And the Nevilles alone are responsible for a significant number of these “never would have had them if not for that one track” discs. Of course, this has happened less over recent years, thanks to many album tracks being made available individually via legal download services like Rhapsody, i-Tunes and Amazon’s mp3 store. We can now fill in the holes in our collections more easily (and cheaply) these days, as long as we are willing to accept the lesser sound quality of the recordings available from these sources. This list does not include contributions made by the Brothers individually. I am listing ONLY those tracks which feature at least three of them! Track 1 released in the UK only. Track 2 was released on a German CD single. Tracks 3 and 4 can be found on the “Konbit: Burning Rhythms of Haiti” LP. Track 5 is on Daniel Lanois’s “Acadie” LP. Track 1 on the “Red Hot + Blue” compilation. Track 2 on a German CD single and on a US promo CD. Track 3 on an American promotional CD. Tracks 4-6 on the Japanese “Fearless” EP. Track 1 on the “Austin City Limits: Big Blues Extravaganza” compilation. Track 2 on the “ONXRT-Live from the Archives Volume 3” CD. Track 1 from the “Austin City Limits Music Festival: 2004” compilation. Track 2 from the “Hurricane Relief: Come Together Now” compilation. Track 3 from KBCO radio’s “Studio C – Volume 17” cd. Tracks 1-4 from the “From the Big Apple to the Big Easy” DVD. Tracks 5-7 fro the “New Orleans Concert – The Music Of America’s Soul” DVD. Track 8 from the “KGSR Broadcasts – Vol. 13” CD. While the NevilleTracks discography focused primarily on recordings, which were released to the general public at one time or another, I have always wondered just how many songs were written but never recorded. Or, better yet, how many were recorded but not released? I recall once reading in a record collector’s magazine that A&M Records alone had enough unreleased Neville recordings to fill a 2-CD set! There is a disc circulating among collectors, which includes the unreleased song “Louisiana Woman” (from the band’s debut LP on Capitol Records.) In the early ‘90s, Ivan recorded a follow up CD to “If My Ancestors Could See Me Now” for Polygram Records, which was scrapped at the last minute (and some – but not all – of which ended up on his “Thanks” CD.) And these were just the handful about which I already knew; presumably, there were others as well. The Copyright Office’s site is not without its flaws, but it’s still a great place to start. And, as such, that’s where I decided to start my exploration of “Great Lost Neville Tracks.” A second installment, which focuses on the information available on the ASCAP and BMI web sites (and which was also written back in 2008) will be posted here in the very near future. Please note that I have added two entries (2010 & 2011) since the original appearance of this article. I have NOT made any other changes although I do plan to review the Copyright Office’s web site eventually to see if there have been any additions since I did my initial research. On September 25, 1978, three songs were copyrighted, which have never appeared on any Neville LP (although one of those tracks has made it into collectors’ hands, along with rough mixes of a half dozen of the songs on the “Neville Brothers” LP.) “Louisiana Woman,” the one song that has leaked out, was written by brother Charles. “I’m Burning Up” and “I’m Calling Your Bluff” are registered to “Neville Productions, Inc., employer for hire.” As such, we are unsure if either song was composed by one (or more) of the Nevilles, or if some outsider wrote them on behalf of Neville Productions. Nor are we sure if the songs were ever recorded. On August 20, 1979, “Cradle Days” (music by Tony Berg and Aaron Neville – lyrics by Aaron Neville) was registered. The song has never been released by any of the Nevilles although it was recorded and released by Bette Midler on her “Thighs and Whispers” LP in 1979. In May of 1980, a song titled “If You Want It” was registered to Ivan Neville, Cyril Neville and Nick Daniels. (The song is alternatively known as “If You Want It, You Can Get It.”) In July of 1980, Ivan and Reginald Cummings (who had written the classic Neville song “Dance Your Blues Away” a few months earlier, copyrighted their composition, “Let’s Get To It.” In August, brother Charles copyrighted his “Music from Shangri-la,” (which was written in 1979.) According to Charles’s biography on the official Neville Brothers web site, “…Drawing from his experiences at the Dew Drop Inn, Charles conceived and arranged the music for a musical called Shangri-La.” In late September, Aaron copyrighted a collection of his poetic works! Presumably, some of these poems have been used as song lyrics. “I’m A Big Boy Now” was registered on February 15, 1983 and was written by Aaron and Ivan. It appears as if the song was later recorded for “If My Ancestors Could See Me Now,” as it was reregistered at that time. “I Can See It In Your Eyes” (which would be recorded in the 90’s for the Brothers’ “Family Groove” LP) was registered at the same time. In mid-September of the same year, “All Day, All Night” (Ivan Neville, Ronald Jones) was copyrighted. 1984 saw Ivan and Cyril registering several tracks each, which have never been released (if they were recorded at all.) First up was “Get You Tonight” (Paul Robert Walsh, Ivan Neville, James B. Hutchinson,) which had been written the year before and was finally copyrighted on March 16th. On April 10th, the songwriting team of Ivan Neville, Paul Robert Walsh & Leo Nocentelli registered two songs, “Slapjack” and “Breakout.” In late August, brother Cyril registered two compositions. The first of these, “Take a Chance on Love,” was penned solely by him, whereas “I‘m Saving My Love For You” (aka “I’m Savin’ My Love For You“) was the work of Cyril, Brian Stoltz, Darryl Johnson and “Mean” Willie Green. Mid-October saw the registration of three more Ivan Neville-Leo Nocentelli collaborations: “Love in China,” “Tell Me How You Feel” and “You Are The One.” (Paul Robert Walsh also contributed to the last two songs.) On November 20th, “Just Around the Block” (words & music: Brian Herbert Stoltz; music: Darryl Johnson & Cyril G. Neville) was copyrighted. 1987 saw more unissued songs registered than any other year. On March 31, “African American” (a song which we remember hearing the Uptown Allstars perform) was written by Cyril G. Neville, Sr., Daryl Johnson, Kenric Neville and Lyryca Neville. In mid-May, “Losing You” (a song which had been written the year before) was registered to “Ivan Neville; words & music (as employer for hire of Nicholas Tremulis & Roger Reupert. )” In September, Ivan registered three more compositions. “The Hype and the Hoopla” was written with Leo Nocentelli and Nick Daniels. “She’s Too Much” and “What Money Can By” (sic) were written with Steven Stewart. Most likely, the latter tune is the same as “Money Talks” (which was released on Ivan’s “If My Ancestors Could See Me Now” LP. In contrast, 1988 was a very lean year. “All in Good Time” (words & music: Daryl Johnson, Ivan Neville, Nick Daniels) was registered on May 2 and “Funky Promiseland” (words & music by Cyril Neville, Sr., Austin Tony Hall, Willie Green, Aaron Neville & Brian Stoltz) was registered on September 1st. On August 27, 1991, a song titled “Mind Games” was registered to Cyril Neville, Jr., Norman Caesar, Perry Dominguez, et al. / Deff Generation Music, Inc. In December of that year, “Terry Manuel Originals, ’91 (collection)” was also registered (Terrence A. Manuel, Mark Dubuleclet, Charles Moore, Willie Green, George Sartin, Cyril Neville & Vernon Phillip Manuel. These were previously registered in 1979. On March 5, 1992, a song written by Ivan Neville and Hawk Wolinski in 1990 (titled “Sound of Love“) was registered. In October 1992, the team of Art Neville, Eric Kolb, Chuck Sheefel & Dwayne Saint Romaine (who, along with Ron Cuccia, penned the Nevilles’ song “Line of Fire”) registered three compositions: “When the Boogie Comes Down,” “Funk ’em up!” and “On Your Own.” Doctor Charles registered some of his compositions in early November of that year. “She Loves the Clave” which was a staple at Neville Brothers shows for many years, has (unfortunately) never been commercially released. Fans of Charles’s solo work are familiar with his composition, “The Painter.” On November 6, Charles registered two similarly-titled songs, “The Painter (Her)” and “The Painter (Him).” It is unknown if either of these is the song included on the CD of the same name. There were two other very interesting registrations made in 1992. They appear to be retroactive registrations for the compositions on “If My Ancestors Could See Me Now” and on Ivan’s second CD, which was slated for release in the early 90s but cancelled. Ivan has said that the best of the songs from that unreleased LP were rerecorded for his “Thanks” LP, but it sure would be fun to hear the unissued LP. On February 7, “After All This Time & 10 Other Titles” was registered and included 10 songs from the “Ancestors…” LP and one unissued song, “I’m a Big Boy Now” (written by Ivan Neville and Aaron Neville and previously registered on February 15, 1983.) As stated previously, it’s possible that this is the same song registered as “Big Boy” on November 6, 1987. March 5, 1992 saw the registration of “Before My Time & 8 Other Titles” (which is presumed to be the unreleased LP, although we recall Ivan’s mentioning that the LP was to include some classic New Orleans R&B tunes in addition to his original compositions.) Rather than list only the songs, which were never released, we are listing all of the songs registered that day, hoping to give an idea what the track listing on the aborted LP might have been like. On June 27, 1997 “As the Sun Goes Down” was registered by Aaron. This appears to be poetry or lyrics, not a song. On July 2, 2004, a song titled “Itty Bitty’s” was registered to Melanie Bliden & Charles B. Neville.) “Why You Wanna Kill Your Brother? : A Stage Play” was copyrighted by Cyril’s wife, Gaynielle Housey-Neville. On February 18, 2005, “Fight (Ain’t Gonna Lose No More)” (by Malcolm Rebennack, Cyril Neville, D. Lee Carson) was registered and a collection of songs by the same three composers, “Tango: Ton Gris” was registered on September 26 of the same year. “Gaynielle Neville’s Book of Poetry” was copyrighted on June 19, 2006. In March 2008, “The Bachelor Club” (a play by Cyril G. Neville, Jr., and Patrick John Marrero) was registered. The Rarest Neville Brothers 45 ??? I’m sure no one could have predicted how much record collectors would be paying for hard-to-find soul and R&B 45s, just a few decades after their original release. Original copies of Aaron’s “Hercules” single from 1973 often sell for at least $150 in near-mint condition (even though both sides of the disc are readily available on CD.) And, certainly, Art’s “My Babe” and “Little Liza Jane” singles on the Cinderella label (1963) are nearly impossible to find. (The former seems a bit easier to find and sells for around $25. The latter seems much rarer – I have only seen one copy ever – so I can’t even venture a guess as to its value.) And Cyril’s awesome “Gossip”/”Tell Me What’s On Your Mind” single from 1970 fetches $25 or $30 as well. However, for the purpose of this discussion, I would like to ignore solo outings and discuss what is probably the rarest of all GROUP singles… the Brothers’ self-produced single from 1979 on their own Cookie imprint! As the Neville-ization albums suggest, the Nevilles never exactly sat around waiting for the phone to ring during those fallow periods when major labels didn’t have enough smarts to offer them a contract. 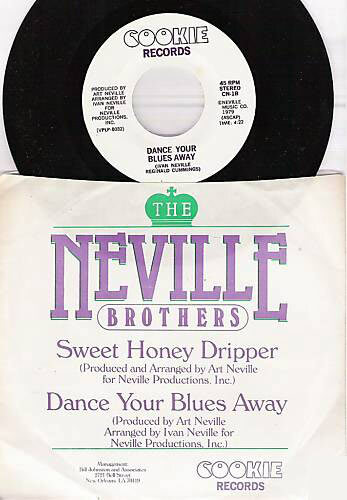 The late ’70s period following the Capitol album was no exception – the Nevilles formed their own Cookie label and released the “Sweet Honey Dripper” / “Dance Your Blues Away” single. It marked the beginning of the period, circa 1980, when Aaron’s son Ivan played a key role in the band’s fortunes and pushed the sound more toward the dance floor. In the past few years, copies of the 45 have popped up sporadically on various internet auction sites such as eBay. Of course, the final selling prices have varied depending on condition and on the way the disc was described. Strangely, when sold as a Neville Brothers 45, it seems to fetch significantly less than when it is described as an Ivan Neville 45. I saw one copy (in fair condition, and credited to the Neville Brothers) sell for $30, while mint-minus copies credited to Ivan fetch over $200 fairly regularly. Back in late 2005, I corresponded with some individuals in the UK and learned a bit about their “Northern Soul” scene. According to the on-line encyclopedia, Wikipedia … Northern Soul is a style of music with associated dance styles and fashions that developed in the north of England in the late 1960s. In the beginning the dancing was athletic, featuring spins, flips, and drops. The music originally consisted of obscure American soul recordings with an uptempo beat, very similar to and including Tamla Motown, plus more obscure labels (e.g. Okeh) from northern cities like Detroit and Chicago (in contrast to southern styles like Memphis soul). By 1970 British performers were recording numbers for this market, and the scarcity of soul records with the required beat led to the playing of stompers, or records by any artist which featured the right beat. The phrase ‘Northern Soul’ was coined by journalist Dave Godin sometime around 1971 when writing his column in Blues and Soul magazine. So, it seems that the source of confusion is DJs relying on the info printed on the 45 (which, in fact, does NOT have the name “The Neville Brothers” printed on it!) So why doesn’t the record sleeve set things straight? Perhaps because the “company sleeve” (as Andy described it) is even rarer than the 45 itself. In fact, before speaking with Andy, I was unaware that a company sleeve even existed. The only copies I had ever seen (including my own) came in plain white sleeves. Very likely, those 80s DJs who erroneously credited the single first to Art (and later to Ivan) never saw the company sleeve either. Honestly, I haven’t been watching the auction sites as much as I used to, so I haven’t kept up on the going price of this rare 45 in a while. In June 2011, a mint minus copy sold for $260.00 through eBay. If you find a copy of this little piece of the Nevilles’ musical history at a price you feel is reasonable, I highly recommend you grab it (regardless of its condition.) Not only is it a sought-after collectable, but it’s truly excellent music as well. Whether on authorized or unauthorized discs, almost all of Art and Aaron’s early releases have been made available on compact disc by this time. Multiple versions of a handful of songs have been released as well, giving the listener a chance to hear different variations on some of these classic tracks. Sometimes, the differences between the different versions are very obvious; sometimes they are much harder to detect. Of course, the differences would be much easier to illustrate if I were to post audio clips; but, due to the current legal climate with regard to on-line audio sharing, I’m going to hope that my descriptions are explicit enough to make the differences clear. In addition to being significantly longer, the demo is much slower in tempo. It opens with piano, drums, guitar and (probably) bass accompanying Art’s vocals. It includes a piano solo and very subdued horns play throughout the majority of the recording. The single version opens with much more prominent saxophones playing a triplet pattern. These saxes remain more prominent throughout the single and one of them performs a solo, beginning at approximately 1:05 into the song. The original version is slightly faster (and 25 seconds shorter) than the alternate take. The two versions are almost identical in length and distinguishing between the two is somewhat tricky. The sax solo differs between the two and Art enunciates many words more clearly on the alternate version, but these things only help if you have two versions on hand to compare. The most obvious lyrical difference occurs during the last verse of the song, which begins at 1:32… “She finally gave in and she came through nice. Now we’re living in paradise. And you can hear both of our hearts sing. You know that I love you, you fine, fine thing.” The last line is sung as “Yes, I love you, you fine, fine thing” on the alternate version. Again, both versions are the same duration, so we can’t distinguish between the two versions based on their length. And, while the two versions are very similar, Art DOES take a fair amount of liberties with the melody, so the melodic differences can help us distinguish between the two. During the opening two lines of the song (“Well you can talk about the seven wonders of the world. You haven’t seen nothin’ till you see my girl”) the pitch of the words “till you see my girl” goes up dramatically on Version 2. Also, after the saxophone solo, the first line of lyrics (“She can’t last much longer, that’s without any doubt”) is slightly different between the two versions. The word “that’s” is omitted on version 1. Another easily detected difference is the very ending which is much tighter on version one, where the snare drum and saxophone play the same rhythm (straight quarter notes) during the final word of the song. The vocals on version 1 feature a subtle reverb (or delay) effect. The vocals on version 2 are completely “dry” (meaning that there has been no delay or reverb effect applied to them.) (For a description of the difference between reverb and delay (aka echo,) there is an excellent one at http://makeshiftmusician.blogspot.com/2008/05/difference-between-reverb-and-echo.html. And, even though this definition makes sense on paper, I still can’t HEAR the difference myself! Again, the differences between these two takes are quite subtle. The sax solo on Version 1 is better (in my opinion.) The one on version 2 sounds slightly out of tune at first and squeaks a bit on the highest notes. The lyrics are mostly the same until the final chorus (around 1:48 into the song.) Version 1 features the lyrics “Belle amie, belle amie. Can’t you see can’t you see” while Art sings, “Belle amie, belle amie. Come over here by me” on version 2. On version 2, the guitar and bass are louder than on version 1. Also, during the song’s intro, the guitar and drums sound tighter (more together) on version 2. If you missed those differences, he sings “yeah yeah now” after the final “Everything’s gonna be real cool” on version 1 but NOT on version 2.